Warning: This is a long walk ………. and it’s a long blog. 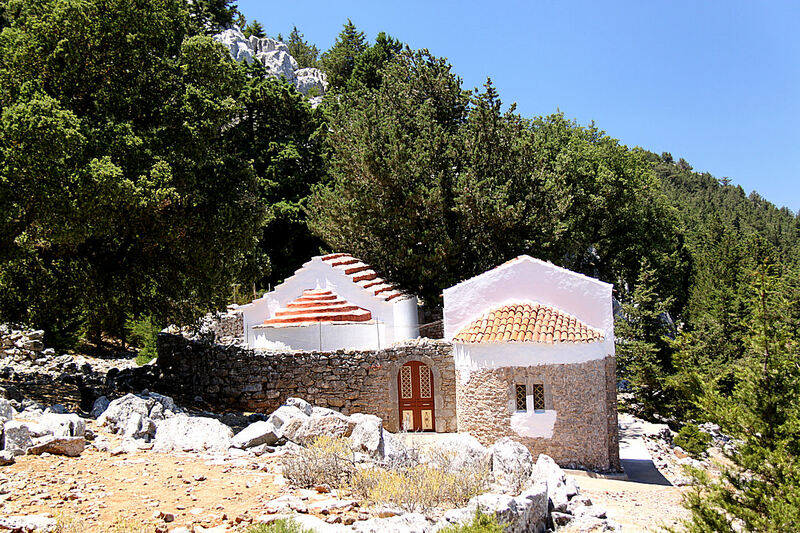 Long, somewhat strenuous but not technically difficult, is the rewarding trek up to the main ridge on Symi and then along the spine of the island to the mountain-top monastery of Stavros Polemou and beyond that to stone wine presses built in the Byzantine period. 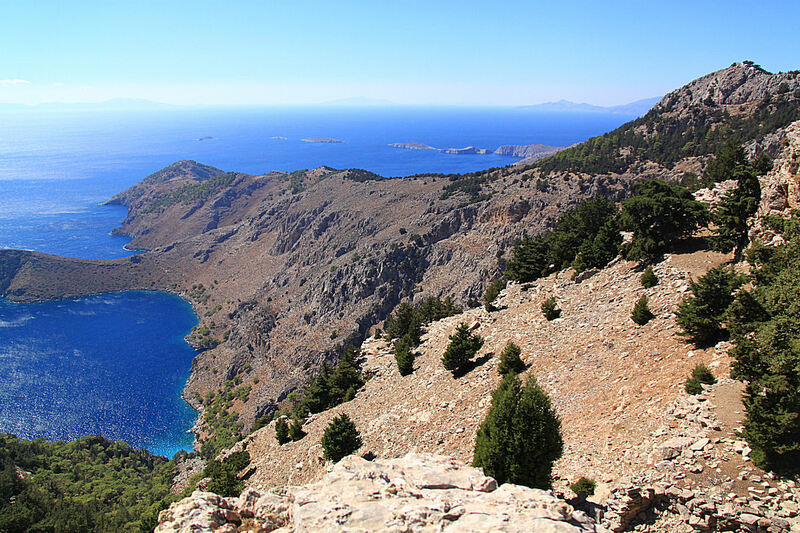 It’s a walk which shows that Symi has much more to offer than just the most attractive and dramatic harbour in Greece. I tackled it during the final few days of my stay on Symi this year and as ever a willingness to go off the beaten track paid dividends. Again the start of the walk is up to the fabulous Viewpoint above Horio but instead of continuing along the well trodden kalderimi polished by centuries of passing feet and hooves I turn left immediately after the gate onto the open mountain and follow a much less used kalderimi zigzagging steeply upwards. The path is clear enough, edged by stone retaining wall though in places the rough-paved surface is now broken up. It’s very satisfying both to reflect that this is a routeway used for centuries and to glance backwards to take in the increasingly dramatic view over the harbour with its neo-classical architecture, Nimos Island and the mountainous coastline of Turkey and its gleaming white wind turbines revolving lazily in the shimmering heat. But then the kalderimi is suddenly interrupted by a bulldozed dirt track going ……… nowhere! It’s impossible to carry on along the line of the kalderimi because it is further interrupted by rubble pushed over the edge from The Tarmac Road. Digression here while I vent some spleen. These ancient routeways are as much part of Greek heritage as is the Parthenon, they are the legacy of the common people over centuries, yet on Symi they have been and still are routinely and thoughtlessly damaged. European funding is secured for road building projects which then bulldoze through kalderimia with no attempt to secure continuing access to them. During construction rubble is pushed over the edge onto the pathway below further preventing their use. I guess my beef is that Symi is an attractive island with a rich history, with very strict regulations to protect the heritage of the neo-classical architecture, and yet offering no protection for ancient routeways which are needlessly damaged and destroyed. It is common practice to protect old routeways during road construction on other islands, why not here on Symi? No additional cost need be involved, just a bit of thought, a little planning. But enough of griping, back to the otherwise very enjoyable walk. 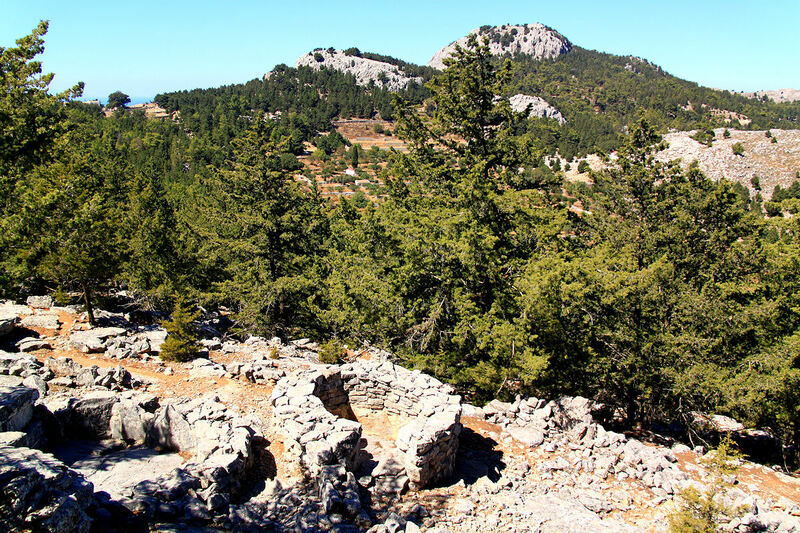 A ten-minute trudge along the road and I’m back on the interrupted kalderimi leading to two small monasteries before joining a narrow path over very broken, rocky ground. Soon after I start picking my way along this path I’m joined by the young dog which had barked at me from inside the fenced compound of one of the monasteries. A hunting dog used for retrieving, it had probably been locked there by its master until it was next needed and, desperate for companionship, had leapt the fence having seen me pass. Unlike dogs on some islands, brutalised to provide snarling guard, it showed no aggression, just delight at having company as it raced around me over the rocks with enviable alacrity. It would disappear bounding over rocks and scrub and then come back having picked up my scent again. After half an hour or so it shot off down a valley just before the path went into an extensive cypress and pine woodland. I guess that the smell from the pine needles carpeting the floor masked my scent because it didn’t reappear again. The path continues through shady woodland, in some places masked by pine needles but you soon learn to look for the line where they are slightly more compacted and thankfully I didn’t take any false trails. Coming to a dirt track, Stavros Polemou, my first goal, is straight ahead perched on top of a rocky crag rising above the trees. There is an irony here. The beginning of the next section of path is difficult to see, indicated only by very faded paint dots on a large rock, but within 100 metres of leaving the track there is more paint marking the route than I have seen on any path anywhere. 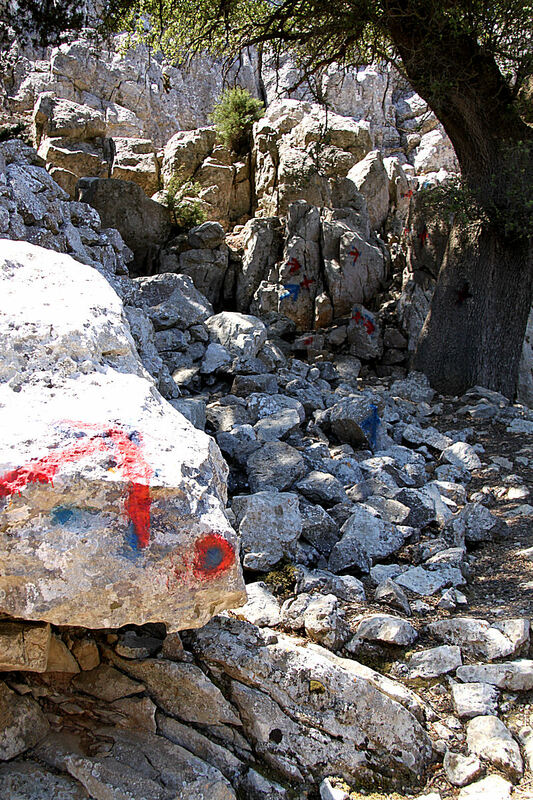 Several crosses and daubed lines a foot high in red and blue are in view at any point on the path as it winds between the rocks and trees to reach the base of the crag and then showing the best line up it. I don’t know for a fact, but suspect that the use of crosses rather than simply dots to mark the path is significant. ‘Stavros’ is not only a male name but also means ‘cross’ and indeed locals I have met up in the mountains refer to the monastery as ‘The Cross’. The full name of the monastery, Σταυρός Πολέμου (Stavros Polemou) means ‘The Cross of War’ in recognition of a battle which once took place here probably with the Saracens. It’s certainly in an eminently defensive location. 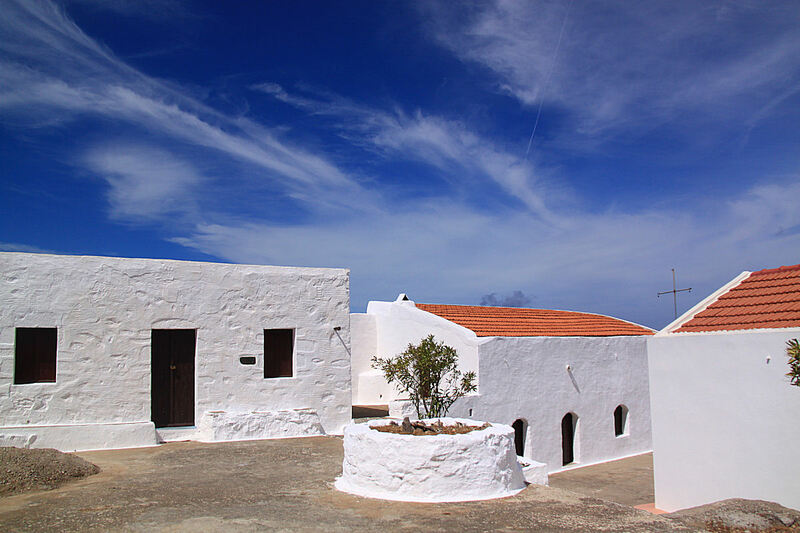 At a height of over 500 metres the views across the island are expansive if somewhat blurred by heat haze. Most clearly visible to the Southeast is the Abbey of Magalos Sotiris also perched on top of crags and further away the very large Panormitis Monastery with trip boats the size of toys entering and leaving its sheltered natural anchorage. After taking in the view and eating my banana I head back down to the monastery of Panagia Panaidhi at the foot of the crag. Behind 3-metre high walls the courtyard is very shady and always cool. 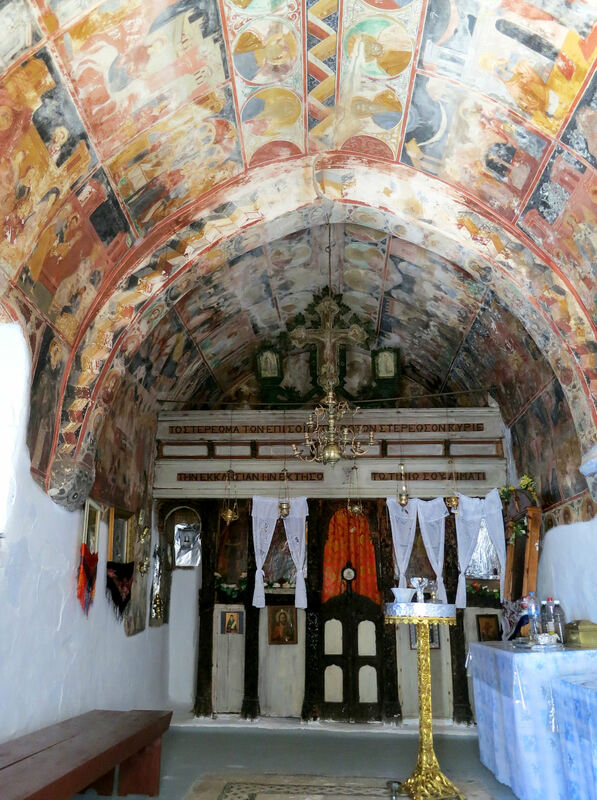 The church, built in 1728, has a very fine black-and-white pebbled Hochlakos mosaic floor and the walls and arched ceiling are covered in frescoes painted at that time and depicting stories from the Bible for the edification and instruction of a people those centuries ago who couldn’t read. 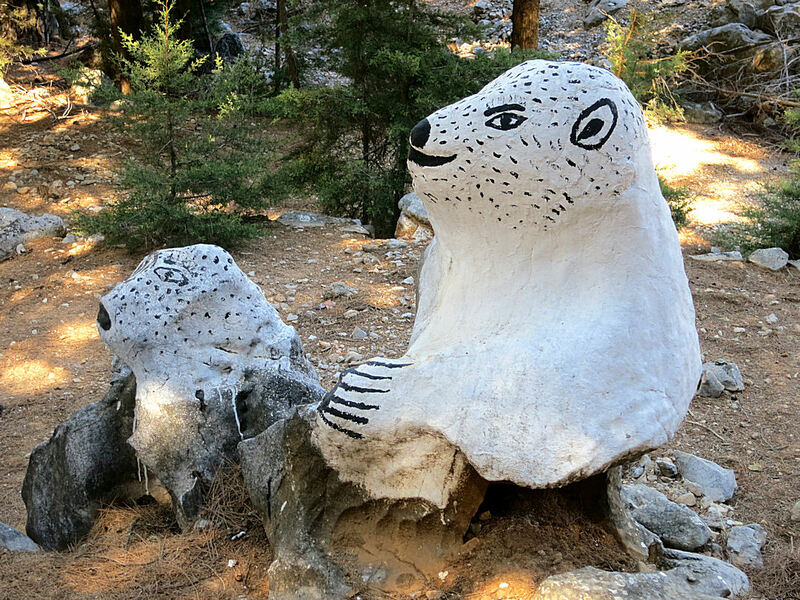 Over a rocky outcrop and through more woodland the footpath back to the tarmac road takes little time and then I head for the wine presses, passing first the Heroes War Memorial commemorating the execution of patriots and then the monastery of Agios Dimitrios and a polar bear. 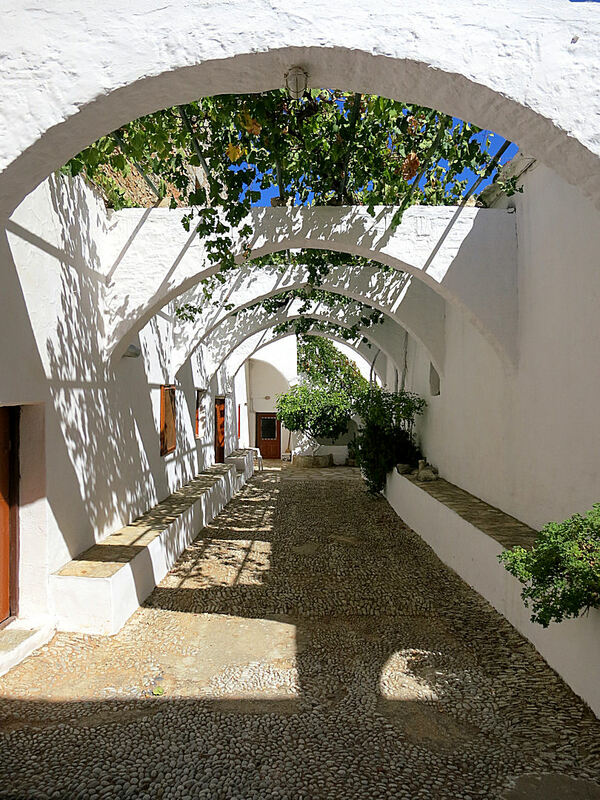 The path to the wine presses begins opposite the Abbey of Megalos Sotiris and is a very pleasant, level walk along the ridge, broad and well maintained because it leads to the small monastery of Agios Michali Kourkouniotis beyond. Tour guides stopping at the sponge shops on the harbourside mean that most people know that the island gained great wealth from sponge diving, having the equivalent of the accolade ‘By Appointment to the Ottoman Royal Court, suppliers of Sponges’. 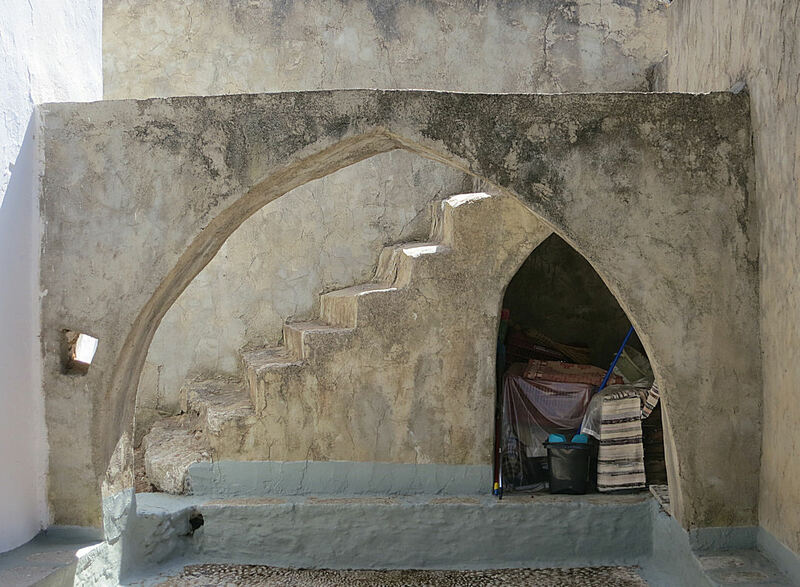 It is also fairly well known that the island had a reputation for ship building at Harani, supplying some of the fastest vessels in the Mediterranean and, ironically, ships which helped secure Greek Independence from the Ottomans in 1821. What is less well known is that the island also had a reputation for its fine white wines, exporting to neighbouring islands and to Turkey. There is reference to these wines as far back as 1420 but it is probable that the industry was thriving much earlier. 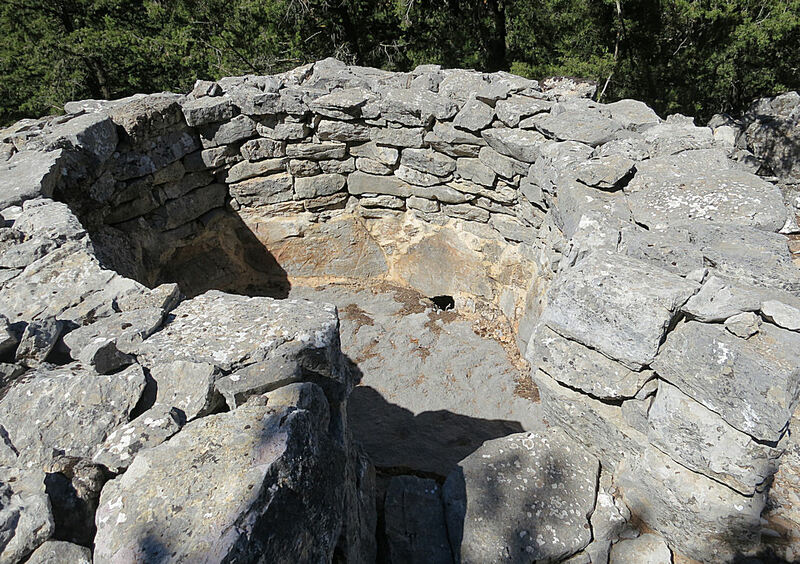 Altogether some 130 stone wine presses have been found and recorded on Symi, with 47 of them in the area between Megalos Sotiris and Kourkouniotis. Built around large slabs of flat stone surrounded by others on edge mortared in place and topped by thick stone walls, their location was crucially dependant on geology but the fact that they were high on the ridge top meant that they were also free from pirate raids. Grapes were loaded in and then trodden in traditional fashion, two or three people per press. In the mid 19th Century viniculture declined substantially because pirate activity in the Aegean made the export trade unviable. Now 11 of the presses have been restored by researcher/author Kritikos Sarantis1 and make an interesting visit. I wondered where all the grapes came from to fill them. It is now early afternoon and time to head back to Horio, another couple of hours away at a good pace. It is possible to catch the island bus to and from the Abbey back on the tarmac road but the alternative route back has some pleasures not to be missed and with fitness level honed by 6 weeks of walking in the islands I’m still humming with energy. Perhaps as well because I make two diversions en route. The first is at the Abbey, after only a few minutes of the trek back completed. Looking like a fortification and normally locked, the padlock on the gate to the compound is today hanging open. Intending simply to go across the compound to photograph the view from its perch on the edge of the crags, I find that the huge iron-studded oak door into the inner courtyard is also open, so I go in. The guy doing maintenance and odd jobs nods in welcome and lets me wander around at will. 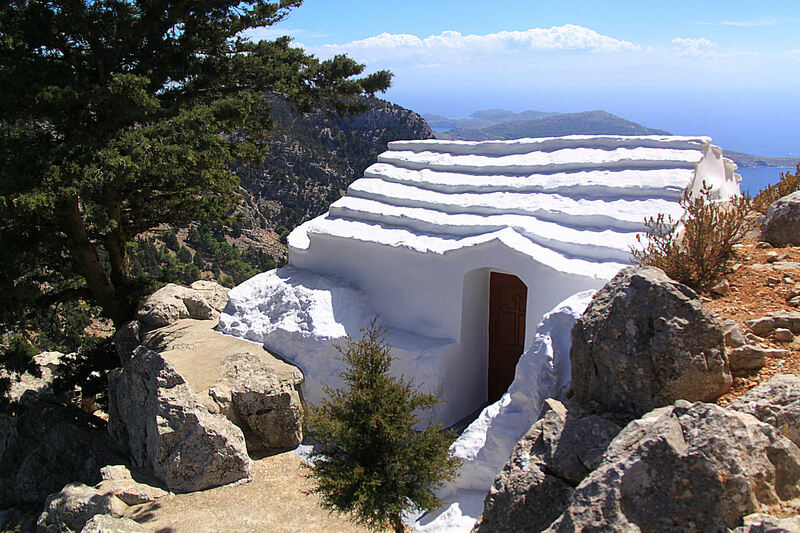 Quiet, peaceful, cool, inside the walls embodied the Greek concept of «ησυχία». 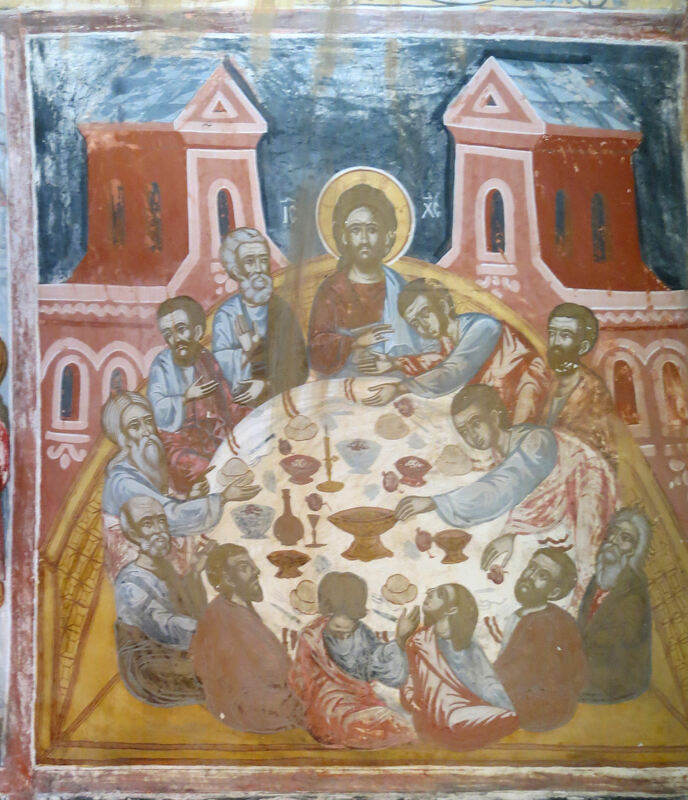 The chapel was significantly bigger than any of the others I have seen in the mountains and again walls and arched ceiling were covered in frescoes which, even though painted in 1827, were more vibrant and better preserved than any others I have seen. I could have stayed much longer but I had a lot of ground to cover and the guy was making a move to lock up and leave. The first thing I do on leaving the Abbey is to climb up the rocky bank at the side of the road on yet another diversion. 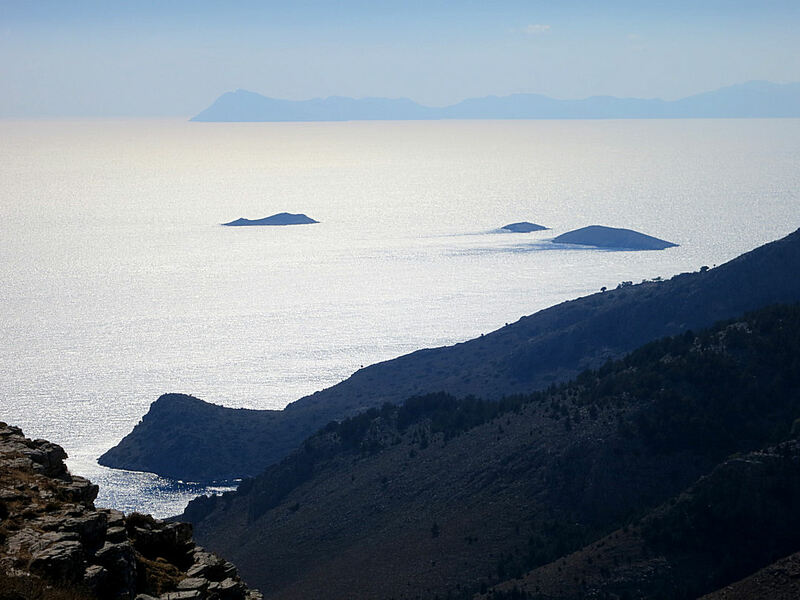 A few paces and I’m on the edge of a cliff looking down 500 metres to the bays and small islands spread out below with Tilos and Nisyros grey silhouettes on the broad horizon. Half an hour of clambering on the towering crags and I very reluctantly decide I can’t encompass the whole view in one photo and should really be on my way. To be honest, the photography was just a pretext for spending time on the edge, picking out possible ways down and ways up, letting the place soak into my brain. I resolve that next year I will come back specifically to explore further. The alternative route back necessitates trudging along 3 short sections of tarmac between footpaths but is well worthwhile for the views and the surroundings. 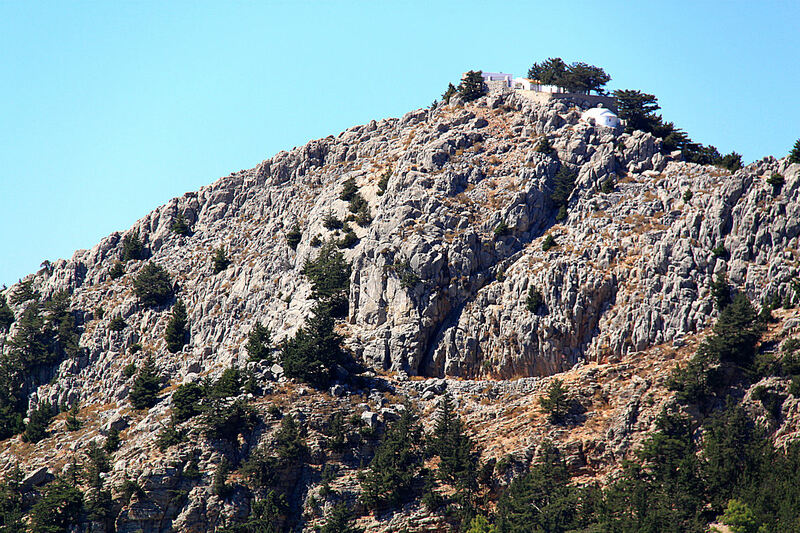 Perhaps most impressive is the long curve of stone-embanked kalderimi, an inside curve on the tarmac road above, with the top of Vigla, the island’s highest mountain, straight ahead. 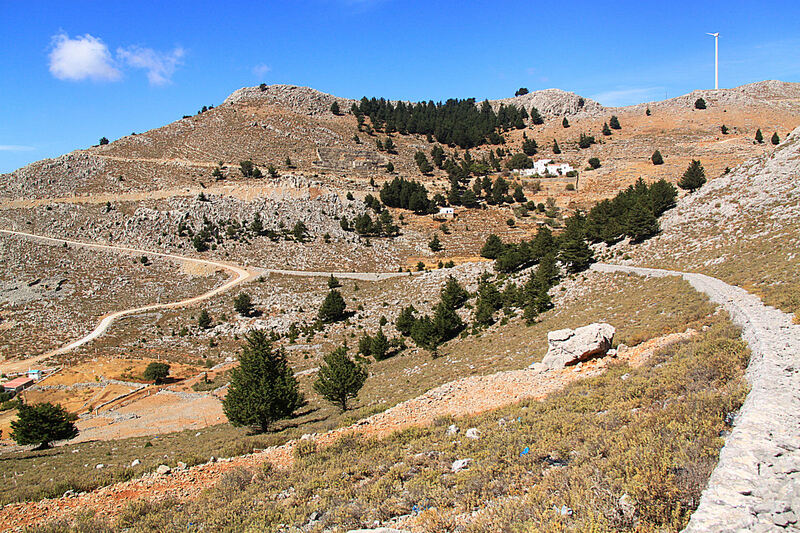 I resist the urge to go off-piste yet again and look for a way to the top and instead head back to sit in the kafenion, sip a cold beer, and wallow in the satisfaction of a good walk topped by new experiences. NOTE: If you want to do the walk the following Walking Guides may be useful. Preparation of the second of the two is still in progress and so it is incomplete but takes you as far as Stavros Polemou. 1. 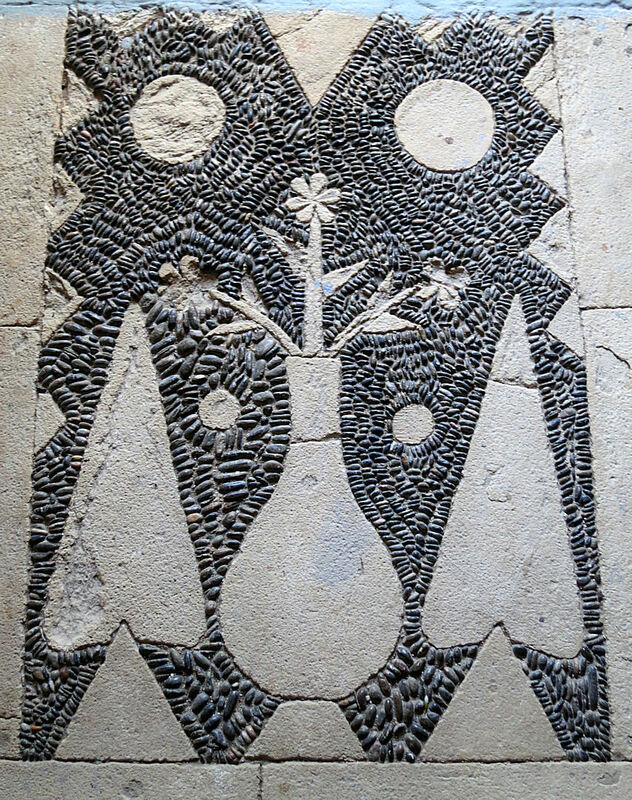 ‘The stone wine presses of Symi’, a slim book only available on the island but there is a summary of it on the Symi Dream website. 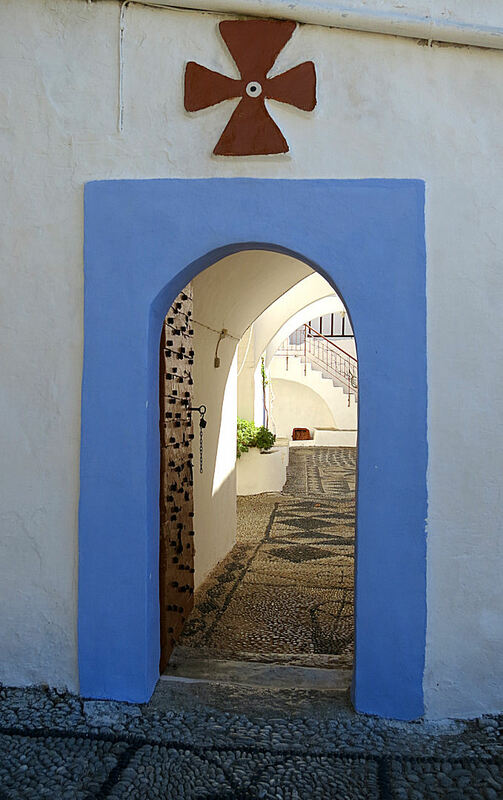 This entry was posted in Art, Greece, Hiking, History, Landscape, Mountains and tagged Byzantine Stone Wine Presses, frescoes, Greece, heritage, hiking, kaldarimi, Megalos Sotiris, Ottoman Empire, Panagia Panaidhi, polar bear, sponge diving, Stavros Polemou, Symi, trekking, viniculture, walking guides, walks. Bookmark the permalink. Barry we are praying ‘That underneath are the everlasting arms’ Deuteronomy 33.27 especially on your lonely walks in all that beauty around you; carrying the vision of beautiful Enfys in your heart too.